Prestige Concreting Additives has been successfully supplying concreting additives to local and export markets for 12 years. However, operator health and safety issues and a need to increase throughput, meant that the company had to improve the blending operation at their of Carrum Downs factory. The system that was in use at Prestige was typical of so many manual blending operations. 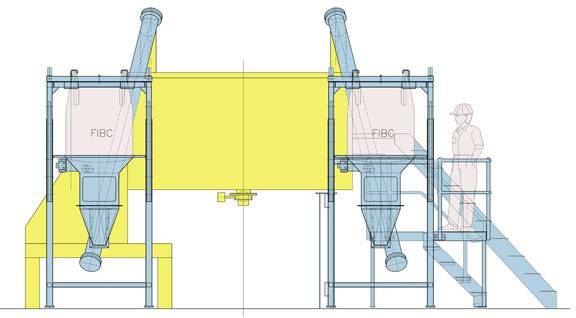 The 6 tonne capacity ribbon blender was directly manually loaded with the required formulation, bag by bag. This was time consuming, and labour intensive with a lot of double handling of the bags. It was also very physically demanding work. Once the blend was complete, the product was then packed off directly from the outlet of the blender, using a pneumatic foot switch controlling the outlet valve and a simple weigh scale platform. This again was labour intensive, and also relied heavily on operator experience to minimise variations. Prestige contacted dynamic weighing specialists Total Engineering Systems Pty Ltd (TES) for a Batching and Bagging solution that would automate their current manual process, but also allow easy resumption of the manual process as a backup in case of a breakdown. In addition to this, the new system had to fit into the very limited space available in the current situation, where both headroom and floor space were at a premium. A further challenge for TES was the variation in the range of cement and grout products blended on the system. This consisted of two “heavy density blends”, in the region of 1,900 kg/cu.m, seven “medium density blends” and one “light density blend” of approximately 1,000 kg/cu.m bulk density. After careful consultation with the client and full consideration of the both the technical and physical challenges the projected presented, TES designed, supplied and installed a batching system that overcame the manual handling issues and a bagging system that was independent of operator experience. Combined, this system increased the production capacity by 25%. The batching operation (blender loading) is now done at floor level, eliminating the need for lifting bags on to a blender loading platform. It is comprised of two FIBC (bulk bag) unloading stations, with one station also incorporating a bag dump station for 25kg bags. Product is conveyed up to the mixer by a screw conveyor from the bulk bag unloader or bag dump. Colours or other minor ingredients can still be added directly to the mixer as required. The use of FIBCs in this way has greatly reduced the manual handling requirements and also, when combined with the new systems ability to load products simultaneously, has contributed to the increased capacity of the system. The new bagging system has the versatility to allow for the filling of either FIBCs or bags. This consists of a TES Gross Weigher for filling 20-23kg bags. The Gross Weigher is arranged on a pivotal system which allows the weigher to be swung out of the way to allow unimpeded FIBC filling operations. The feed screw for the Gross Weigher is mounted on a rail system allowing it to be also easily repositioned for filling FIBCs and clearing space for positioning the required platform scale. The bag closing conveyor can also be slid out of the way. Total Engineering Systems designs, manufactures and services weighing equipment, complete weighing systems and software to meet bulk material blending, process control and stock handling needs. They are an approved Trade Measurement licensee in Victoria and provide regular on-site servicing and remote technical support across Australia and overseas. They are the sole Australian agent for the EMC range of Controllers and distributors of Precision Transducers Load Cells. Metal Detection For Bulk Materials.